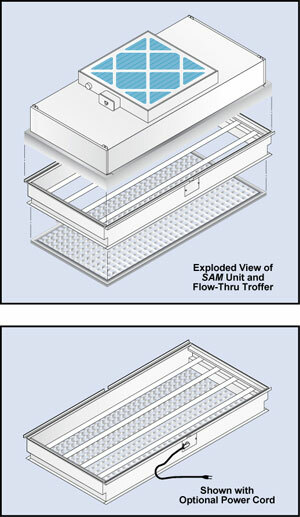 Flow-Thru Troffers allow HEPA or ULPA filtered air to flow through the fixture and into the clean room. Flow-Thru Troffers feature four lamps, sealed housings and a white powdercoated finish. A drop-down acrylic eggcrate grille with an anodized aluminum frame permits removal of the lamps and ballast from roomside. 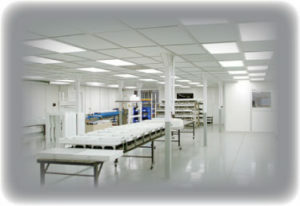 Standard ballasts are 120-277 Multi-voltage, T8 electronic for use with (4) medium bi-pin lamps. The ballast is mounted inside the housing and is removable from roomside. Note: All Multi-Voltage ballasts are 50/60 hz.